Tata Motors is India’s first indigenous international motor conglomerate, a subsidiary of the Tata Group which makes vehicles in 4-wheeler segment includes passenger cars, trucks, vans, coaches, buses, construction equipment and military vehicles. It is the world's 5th-largest motor vehicle manufacturing company, fourth-largest truck manufacturer, and second-largest bus manufacturer by volume. Tata launched the Indica in 1998, the first fully indigenous Indian passenger car and since then there is no looking back. In 2008, Tata Motors acquired the English car maker Jaguar Land Rover, manufacturer of the Jaguar and Land Rover from Ford Motor Company. So far Tata Cars have done extremely well in commercial taxi segment however failed to capture attention of private car users especially in compact SUV/ SUV segment. While Tata Safari was launched several years ago, followed by Tata Aria – however poor styling, lack of modern features targeting youth and comfort factor was completely missing. However Tata Motors has been riding high on the success of the Tiago which got big thumbs-up from the market, mainly due to the new design which is a major USP. This lead to birth of TATA HEXA - which starts from INR 11.99 Lakhs upto INR 17.40 Lakhs (Delhi). In 2013, Tata engineers were tasked to build a powerful SUV from the scratch. Post JLR acquisition by Tata, for the first time design teams from UK, Italy, India and Korea were clubbed and Hexa was conceptualised and code named as Eagle. In fact a lot of ques were taken from JLR (Land Rover) Engineers to build the framework, drive modes and interiors of this SUV. This new SUV is based on entirely new concept called IMPACT. Impact framework covers the following aspects of the SUV – it should be Exciting, Expressive, Extraordinary, Inviting, Intelligent and Intouch. Machine should speak louder than words and rhetoric – Tata Motors in alliance with Indiblogger organized #HexaExperience event in city of Nizams "Hyderabad" which included 2 days of extensive self driving road test to top 60 bloggers from India. No precondition apart from valid 4 wheel driving license was needed. The message the loud and clear – the moto-bloggers will drive this SUV upto 160 Kms (to-and-fro) from Hyderabad to Vikarabad in all terrains followed by some extreme road testing and would share our unbiased feedback about this SUV. Let’s get into the basics of car like the exteriors, interiors and engine to understand the overall build and quality. Hexa is a completely new SUV, refreshing and sturdy – it is powered by its ‘Impact’ styling. 1) Dual colored bumper with Tata Signature Grille accentuated with chrome humanity line is quite appealing. 2) The striking Ice cube patterned DRLs seamlessly integrates with stylised fog lamps making SUV looks truly bold. 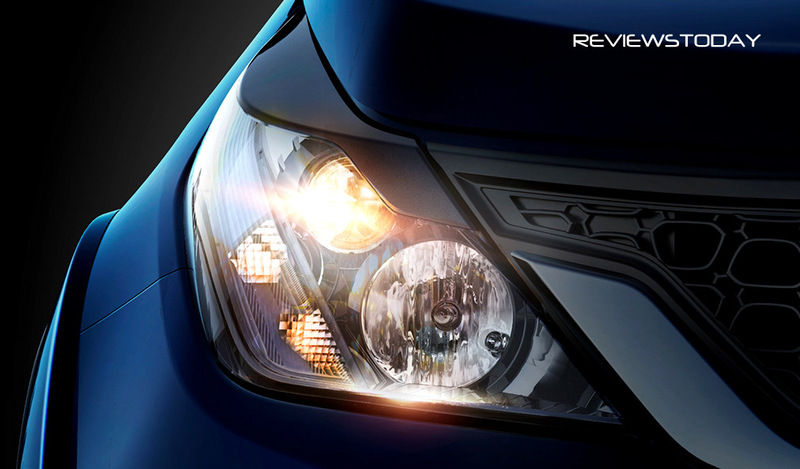 3) Smoked projector headlamps complement the assertive front fascia of this adrenaline machine. 4) Hexa also unveiled muscular wheel arch cladding which nests best-in-class 19-inch alloy wheels seen usually in high end SUV like Land Rover, Range Rover, Audi etc. 5) Dynamic floating roof and wraparound chrome feature line with Hexa embossing gives the contemporary silhouette to the SUV. 6) Wraparound stylised horizontal tail lamps with first-in-India patented flexible LED technology connected by a refined chrome applique is another usp of this SUV. 7) The side profile does look similar to the Aria but this SUV gets ample cladding all around with sharper lines and chrome, making SUV look quite macho. Let’s divert our attention to vital stats of the car. The first thing as you enter the car is the styling – extremely plush and high end. 1) During our discussions with test-driver, he did confess that all the styling within Hexa is inspired by Land Rover and we bet it is true. 2) One would observe that there are multiple shades like polished chrome, piano black, silver accents and matte black. The design is clean and quality of material is of high quality with superb finishes and soft touch materials, textures and grains. 3) In fact we were told by Tata Motors that they had asked their suppliers to re-design the seat from the scratch - right from the quality of foam to ergonomics of the seat. 4) Premium Benecke-Kaliko™ upholstery with contrast stitch and accentuated bolsters makes the SUV super captivating from inside. 5) The SUV comes with Touchscreen Infotainment System which renders multiple intelligent features for enriched convenience such as on-screen SMS display, SMS readout and rear view camera display on infotainment screen. 6) On board Smart USB charging ports modulates charging, based on the connected device was a very pleasing experience. 7) Hexa is loaded with Entertainment tools, InTouch system is powered by Harman music system with 10 JBL speakers of 320 W amplifiers. The sound quality is pretty high end and we loved the bass. 8) The SUV gets its navigation from NaviMap which is an App on InTouch system. There are also other common features such as bluetooth, reverse parking camera etc. 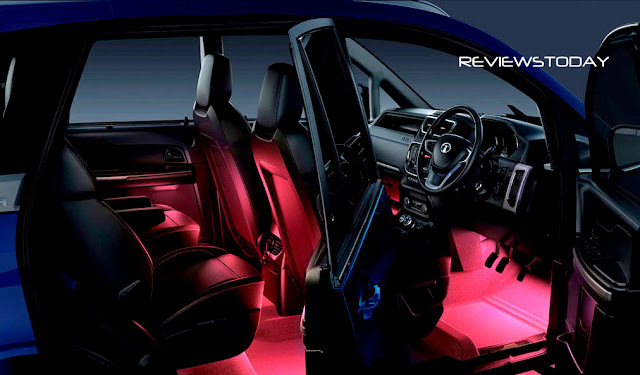 9) The SUV also introduces Ambient Mood Lighting – which offers choice of 8 colours for in-cabin lighting with illumination control and customization. 10) There are multiple AC vents for all rows including side wall vents for excellent cooling. 11) Surprisingly noise cancellation ratio is quite good. One would not hear diesel engine’s or outside noise at all making the cabin quite soundproof. 12) The steering wheel is very very smooth and adaptive. It is so easy to steer the SUV with finger tips. Steering wheel comes with mounted controls as well. This is one of the most important feature of any car. Hexa does not disappoint you here at all. 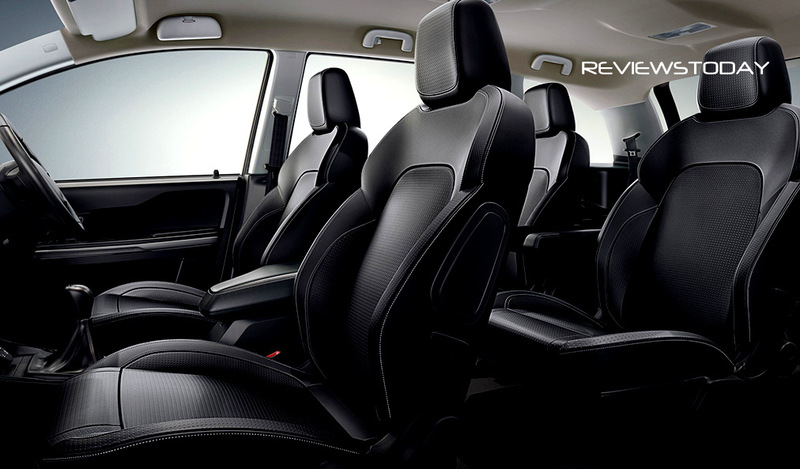 1) The SUV comes with leather seats which are well bolstered and offer good support. 2) Since this is a family SUV, it flaunts a lot of cubby holes and other practical bits. 3) Hexa has a central arm rest in the front row, which doubles as a storage box. 4) It also carries a dual glovebox, where the upper compartment is a cooling box. 5) The second row, of six-seater variant have captain seats which easily slide and even recline. 6) SUV offers excellent knee room in the first two rows however the third row is little cramped but suitable for people with low height and the kids. 7) The boot space is quite small especially if you need to carry luggage for 6-7 travellers. However you can go for rooftop luggage accessories that should fix this problem. 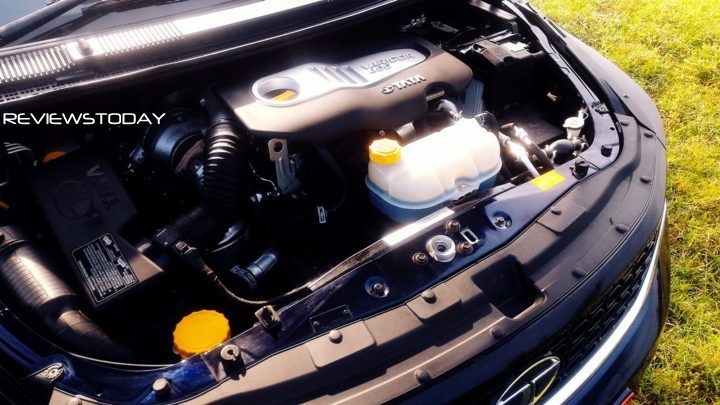 1) Hexa which we test rided came with a refined and smooth 2.2-litre Varicor 400 engine, producing 156 PS of power and 400 Nm of torque. 2) SUV comes in six-speed manual and automatic transmissions offering 4x4 WD and 4x2 WD capabilities. a) Comfort Mode - targeted for city driving to deliver better fuel efficiency. b) Dynamic Mode- we loved this mode as it provide sporty feel by providing extreme thrust capabilities. c) Rough Road Mode – It switches the car to 4x4 mode for better off-road capabilities. The advance traction features kicks in this mode. d) Auto Mode – Its automatically switches between other 3 modes based on road and acceleration condition. 4) Apart from these, manual variant also highlights Hill Descent, Hill Control and Water wadding (upto 450 mm) features which we really liked. 5) The manual gearshift is very smooth and effortless. 6) Automatic Variants offers two driving capabilities – Sports and Auto Sensing Race Car. c) Manual-Auto Gear Switching - The manual gear options in automatic variant was so welcoming and we felt driving like a joy stick in hand with single shift up gear – such features are only available in high SUV from BMW, Merc and Audi. We first drove about 85 Kms from RGIA, Hyderabad to Vikarabad that included ORR (high speed track), State Highway 4 which was single lane with traffic followed by off-road – gravel/muddy trail of about 10 Kms to a Hill resort based in Anantgiri Hills. Both the engines (Auto and Manual) are very responsive and doesn’t make you feel that it’s a diesel car. It is so silent. We drove in Manual Variant initially and it completely nailed it. We tested all the driving options and we loved Dynamic mode in particular as it provided much need for speed at a high throttle. For off-roading, we used Rough Road mode and the SUV just sailed through every muddy pothole or pits with ease. The shocker management is amazing, despite of rough bumpy roads and speed-breakers – people at the back did not feel jerks or bumpy ride. Thanks to its incredible ground clearance of 200 mm. A big thumbs up. While returning back, Tata Motors switched us to Automatic Variant – 2 WD. Automatic variant is extremely easy to drive. It provides regular automatic features- P (Parking), N (Neutral), D (Drive) and R (Reverse). 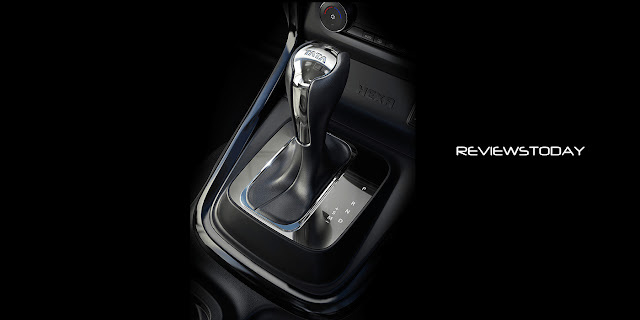 The Automatic variant can be switched to Manual Mode as well with a simple gearshift. The gearshift simply turns into a joy stick and you can switch to upper gears by a simple up-shift giving the driver a video game feeling. However it does take one to get acquainted with Automatic process as it has no clutch. Our SUVs worked very well at low speeds too, and provided amazing torque on high bends at top speeds. In Automatic variant, when the brake were applied it reduces the speed and the gears downshift automatically until the car comes to a stop. Then you need to shift the lever to the ‘N’ mode and then to ‘P’ mode—which indicates ‘parking’ and you can free your legs. The brakes are very receptive and saw live how the ABS, EBS and Tractions kicks in when you suddenly have to apply brakes in emergency. This was the USP of the #HexaExperience event. Hexa was tested by Land Rover Test Drivers who gave us the demo on Land Rover Test Track near Novotel, Hyderabad. Allows your SUV to perform on two wheels. The SUV rightly balances on two diagonal wheels – while other two wheels are in air. 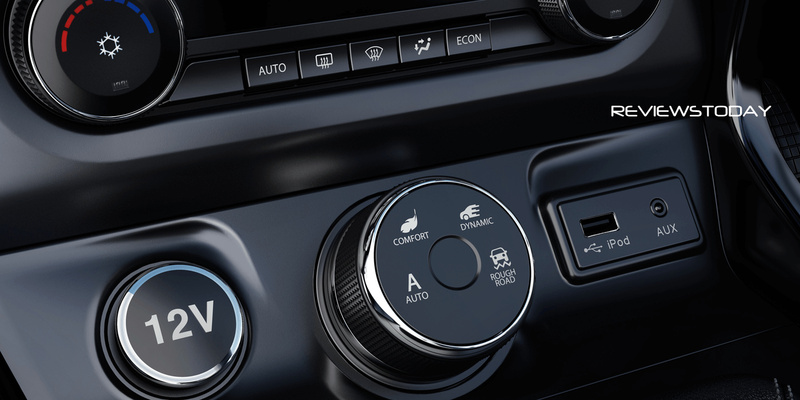 This is a feature which is present in Land Rover and is now transitioned to this SUV. For layman, in standard SUVs, 60% of power is transmitted to the front two wheels while remaining 40% is transmitted to rear wheels. Now if two diagonal wheels (1 front and 1 rear in diagonal) are in air, standard SUV will have half (30 + 20 = 50% ) power to use and while 50% of power will go for waste. However in Hexa, the 50% of power which is being wasted can be diverted to two wheels (diagonal) which have traction and Cross Axle situation can be mitigated with lot of ease. Now this is a feature which comes handy if you are travelling to the snow clad mountains filled with snow or areas which are prone to landslides. These conditions were proto-typed for us for the demo. The ice cubes were placed on an incline. Usually tyres does not get traction and grip on ice – however in this case the Hexa out performed other SUVs – The tyres which did not receive traction, the LSD (limited slip differential) would again shift all the power to two wheels (front and rear) which have traction resulting the SUV to move ahead without any difficulties or sliding back. Hexa comes with 450 mm of water wadding feature which is about 200 mm less than Land Rover and about 150 mm more than Tata Safari. This feature is critical for India as during monsoon, many high end SUV fail to perform in these depths thus making repairs and servicing very expensive. For Hexa, these depths are just another milestones that are easily conquered and one is rest assured that water won’t seep into the engine and ruin it. This feature comes very handy especially when you are driving in hills which have steep slopes or descents. Once HDC is activated, it does not allow your vehicle to move faster than 8 KMPH and thus you need not apply brakes at all – this feature will take care of the braking. Usually the intelligent car system will apply brakes in alternate wheels ( does not put braking on all wheels in one go) one by one and thus your car will not slip or skid. This feature is again for hilly terrain ride. If you are on a steep ascent and had to apply brakes – it will hold your vehicle from moving backwards. This is a useful feature in cities aswell where you have traffic jams on flyovers and the driver constantly have to use braking, clutch and acceleration to prevent vehicle to move backwards, in Hexa it is taken care by HHC. The EBP is an extremely important feature that Hexa provides. These are inbuilt sensors that gauges the panic and activates brakes application automatically. If you are driving at very high speed and remove your legs from accelerator abruptly, the EBP sensors kicks in and will gauge something is wrong and will prepare breaking even before you apply brakes manually. The moment you press the breaks (when EBP is on), the braking is applied to full power enabling much faster stopping thus avoiding fatal collision in real life situation. Hexa offers some great tilting features upto 22 degrees. ESP with rollover mitigation despenses much needed stability to the SUV. However we do not see too much use of this feature on day to day Indian roads, however in few situations like landslides etc, this will come quite handy. 1) ESP (ELECTRONIC STABILITY PROGRAMME) with roll-over mitigation to monitor driving stability and traction. 2) ABS with Electronic Brake-force Distribution to optimize braking distance and to ensure vehicle stability. 3) TRACTION CONTROL SYSTEM which acts as a control system to prevent excessive wheel slip. 4) REVERSE GUIDING SYSTEM with rear-view camera and ultrasonic sensors, with display on the infotainment screen. 5) 6 AIRBAGS (Front, side and curtain airbags) inside the cabin which takes cares of end to end safety. 6) POWER GRIP TYRES has specially been designed by MRF which are meant specifically for the Hexa in order to offer better performance and grip. 1) 8-WAY ADJUSTABLE DRIVER’S SEAT for a Comfortable driving position using horizontal, vertical, angular recline and Lumbar controls. 2) AUTOMATIC CLIMATE CONTROL WITH DUAL HVAC which automatically maintains cabin temperature with personalized air flow and speed control through AC vents in each row. 3) FLEXI SEAT CONFIGURATION allowing 2nd row to be available with Captain’s or Bench seat. 2nd & 3rd row available with multiple folding configurations releasing a maximum 671 L space. 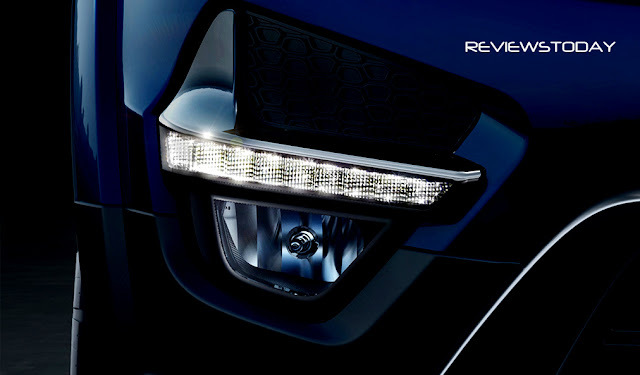 4) AUTOMATIC HEADLAMPS that switches-on automatically on sensing exterior conditions. 5) RAIN SENSING WIPERS are intelligent automatic wipers with 7 speed modes for varying rain intensity. 6) POWER ADJUSTABLE ORVM are electrically adjustable and Foldable Outer Rear View Mirrors (ORVM) with demister. 7) CRUISE CONTROL is available at touch of a button. 8) SUNBLIND are retractable blinds for 2nd row windows. 1) No Neon DRLs – While Mahindra XUV has a very strong and good looking neon front DRLs, the Hexa fails to impress with the DRLs just like Hyundai Creta. We would have expected neon DRLs which are now available even in hatchbacks like Suzuki Baleno etc. 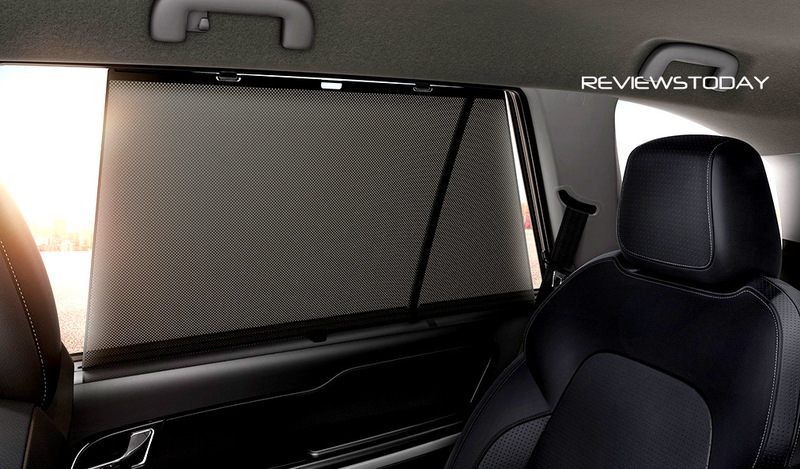 2) Sun-Roof Missing – We would expect a SUV of the Hexa's calibre to feature sun-roof atleast in top end variant. 3) Limited Drive Options in Automatic Variant - The Automatic variant comes only in two drive options – we would expect 4 drive options like in the Manual Variant to be present in the Automatic variant too. 4) Lack of Back Space - Third row and boot definitely needs improvement – it lacks space there. 5) Poor Navigation Tool - SUV's Navigation relies on the GPS of your phone. We would expect inbuilt GPS in the SUV. 7) GPS based Anti Theft Feature Missing- The SUV does not come with an inbuilt Car Theft GPS system - a must have safety feature due to increased car thefts in India. Tata Hexa is no doubt a wonderful SUV. It has full potential & punch to beat Mahindra Scorpio, XUV, Honda BRV and Toyota Innova Crysta. Hexa has clearly imported quite a lot of features from Land Rover which makes it a clever SUV compared to others. We would personally recommend Hexa Manual Variants as it comes with 4 amazing driving options, gives great off road capabilities along with 4x4 WD options. But for those who love city driving and highways – Hexa Automatic can be a good alternative. The Automatic variant gave us a mileage of about 11 KMPL while Manual variant gave us the decent 13-14 KMPL. Tata officials did confirm that they will have Express Service in their exclusive service centres – hence the customers will get customised fast servicing for their Hexa SUVs. From pricing and launch perspective, this SUV is priced at lower price range to that of XUV & Innova i.e. around INR 12.30 Lac for base model while top end model may go up to INR 18 Lacs. The SUV’s official pricing and launch will happen on 17 Jan 2017. We would strongly bet our money on Tata Hexa for features, safety and comfort it offers. Stay Tuned in to ReviewsToday.in for more reviews. Don't forget to leave your thoughts behind and like us on Facebook.